A rag-tag band flees the authorities following a revolt in a South American mining town. Best known for the arthouse classics that bookended his lengthy career, Luis Bunuel spent the middle period of said career making films that might be described as 'commercial', certainly when set against the surrealist and political works he's now more readily associated with. Of course, he managed to inject his trademark surrealism and political fervor into these films, none more so than the trio of movies known as his 'Revolutionary Triptych'. 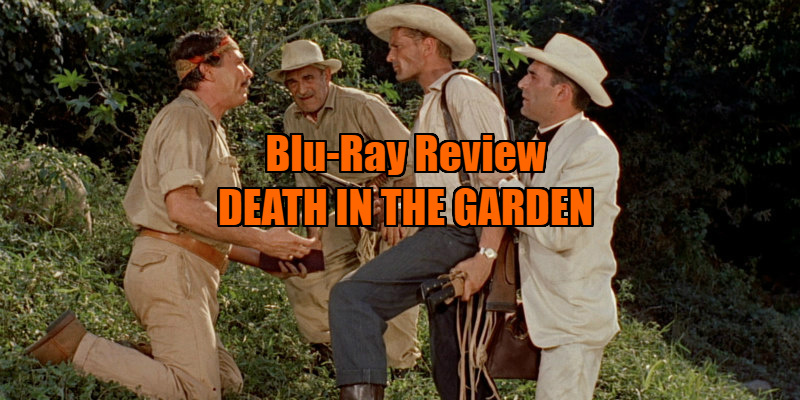 The second in this thematic trilogy (sandwiched between 1956's This is Called Dawn and 1959's Republic of Sin), 1956's Death in the Garden gets a 1080p blu-ray transfer on Eureka's Masters of Cinema label. While the presentation is for the most part stunning, there are occasional shots that resemble a telecine transfer, likely a symptomatic sign of how this film has been neglected over the years in comparison to Bunuel's more celebrated works. Based on the novel by Jose-Andre Lacour, Death in the Garden takes place in an unnamed South American country, not unlike the one portrayed in Woody Allen's Bananas. Of course, revolution is in the air, in the form of disgruntled diamond miners whose claims have been taken over by the government. Caught up in the ensuing violent uprising are a number of disparate characters. Chark (Robert Ryan lookalike Georges Marchal) is a roguish drifter arrested for his involvement in the robbery of a nearby bank. Djin (Simone Signoret at her least glamorous) is the town prostitute, a whore in both literal and metaphorical senses. Father Lizardi (Michel Piccoli) is a priest whose expensive wrist-watch is a not so subtle commentary on the relationship between Catholicism and colonialism. The aforementioned trio represent the misanthropic aspect of the film; more likeable are the aging trader Castin (Charles Vanel) and his mute teenage daughter Maria (Michele Girardon). When Chark escapes his cell amid the chaos, and is given reluctant refuge by Djin and Lizardi (the latter compromising his position by posing as a client of the former to protect the fugitive), the three team up with Castin (whom the revolting miners want to offer up as a sacrificial lamb to the authorities) and Maria, fleeing into the treacherous jungle in search of the Brazilian border and refuge. In its early scenes, Bunuel's film resembles an Eastman Color riff on The Wages of Fear, though perhaps it's closer to William Friedkin's remake, Sorcerer, given how much time is devoted to assembling the rag-tag band of fugitives before sending them into the jungle. Aside from some minor political commentary - which could be read as in favour of capitalism as much as communism, as the film never explicitly tells us whether the unnamed nation is governed by the left or right - there's little to distinguish Death in the Garden as a work of Bunuel; in fact it plays like the many second rate adventure stories that were coming out of Hollywood at the time. It's when our group of anti-heroes enters the jungle that the movie comes to life, as Bunuel hits us with some startling imagery. None more so than a jarring cut to a nighttime shot of the Champs Elysee. As much a shock as the shot of the Manhattan skyline that greeted viewers of David Lynch's recent return to Twin Peaks, the image freezes, accompanied by the sound of a projector grinding to a halt, and is revealed to exist on a postcard in the possession of Castin. Elsewhere there's a truly horrifying image of a dead snake, seemingly brought back to life by the hundreds of ants that have burrowed into its hollowed out body. When Maria gets her hair caught up in branches, the scene is made all the more disturbing by her inability to cry out for help. With its misanthropic nature and cast of mostly flawed and unlikeable misfits, Death in the Garden most closely resembles the series of cannibal movies that would emerge from Italy two decades later. It's a descent into a jungle whose landscape grows less hellish in the comparable presence of the ugly humans slicing their way through its foliage. Interviews with Piccoli, film scholar Victor Fuentes and writer Tony Rayns; a new trailer; and a booklet featuring a new essay by Philip Kemp. 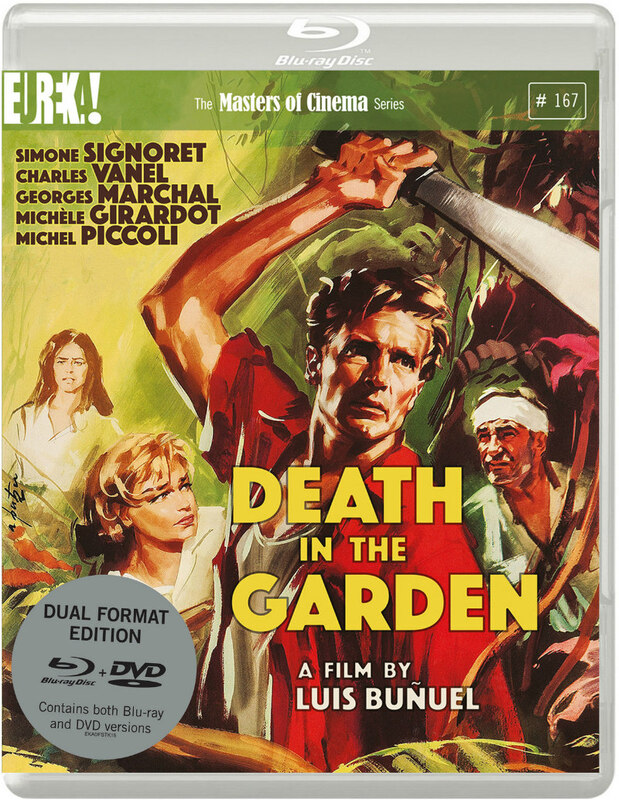 Death in the Garden is released on dual-format blu-ray/DVD by Eureka Masters of Cinema June 19th.